I am so busy I don't have time to write. We have a volunteer team coming in from New Bern NC. next week to work in Chan Chen. We have had a family of five staying with us the last two weeks in our small house in Paamul. God is doing great things in our church we started a new men's small group that thursday and we had seven men come out to the first meeting. Working with the Golf Channel this week. Working with the Golf Channel today at Mayakaba PGA event. They had me with John Daly today. I talked to his girl friend and was able to give her a Golfer's New Testament. This is a bible with testimonies of other PGA golfers. She was real excited and said she would give it to John tonight. 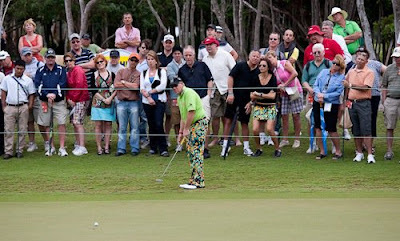 So pray for John Daly. He made the cut now we are praying that he will make God's finial cut. Many of our church members are working this week as volunteers with the Golf Channel. Last year they donated $5000 to our mission organization. Down here in Mexico we don't celebrate groundhog day because by Feb. 2nd summer is already here. We are looking forward to seeing all that God is going to do in the next fee months. Feb. 8 Starting a new small group bible study. Feb. the 10th Darla is making a trip to States to visit family and promote our mission at a Global Mission Conference at Westwood Baptist Church in Alabaster, Al. Feb 18-21 we are going to working as volunteers for the Golf Channel at the PGA Golf Event they for donate funds to our mission work in Chan Chen. We need your prayers and your support.